For hundreds of years, in Laos people grew their own food and made their own clothes, houses, tools, baskets and other things they needed to live. The knowledge of how to do these skills was passed on from parent to child, from one generation to the next. The baskets, textiles, and other items people made were both beautiful and useful. These types of hand-made items are known as traditional art forms. The people who make them are traditional or folk artists. Times have changed and the way people live in Laos has also changed. Most people in Laos now go to the store or market to buy whatever foods they eat and items they need for the home. This is also true for the Lao community living in Oregon. Here people continue making traditional art forms for different reasons than they did in Laos. Their artwork is a service to the whole community. Every piece they make helps to teach the Lao children about their cultural traditions. The folk arts also help the older people feel at home in their new land. Laos has a long tradition of oral literature, including folk tales, children's stories, proverbs, parables and poems. Talented narrators can recite lengthy poems, some as much as six hours long, entirely from memory. Lam or khap is love poetry set to music, performed as a solo or in duets. Some songs go on all night and sessions have been known to last for up to 72 hours. Contests for spontaneous poems and songs are also popular. There are three masterpieces of Laotian literature: the Vetsantrasadok, the Sin Say, and the Thao Hung. The Vetsantrasadok is the most popular and deals with the life of Buddha before his enlightenment. Education through reincarnation is the theme of the story. The poet Phangkham wrote Sin Say. Sin Say, the hero, was born holding a bow and arrows in his hand. His brother, Sang Thong, was a golden snail, and his half-brother was an elephant with golden tusks. The story tells how the ogre Nhak Koumphan stole the brothers' aunt and how the brothers defeated the ogre and rescued their aunt. Thao Hung is a historical epic. Its hero belongs to the Mon-Khmer ethnic group. It recounts the struggle between ancient ruling families in Indochina. The Dhammapada is an important book in Buddhist literature. It contains 423 verses spoken by the Buddha on various occasions. For example, "Mind is the most important thing. It is the source of all actions. If we act or speak with an impure mind, we suffer. But if we act or speak with a clean mind, then we shall be happy." The Dhammapada was originally written in Pali, a language that closely resembles Sanskrit. Did you know that? The Hmong and Mien peoples have traditionally created jewellery from gold and silver. This jewellery was seen as a form of portable wealth. Laotian folk music is not written down but is played from memory. Musical instruments include the khen (a bamboo flute), buffalo horns, tam tam drums, xylophone and a two-string violin. Maw lam, or Laotian theatre, is part of many Laotian festivals. It may be a rehearsed production complete with costumes, or an informal, improvised dialogue between two players. Laos has a rich architectural heritage. One of its most famous buildings is the Great Stupa in Vientiane, which is considered a symbol of the country. The temples at Luang Prabang, the former capital, have been designated a World Heritage Site. They have graceful roofs that sweep down close to the ground. Traditional Laotian handicrafts include weaving and carving. Women weave colourful cloth of cotton or silk that is worn as a long, wrap-around skirt. The intricate patterns may include gold or silver thread. The patterns depict river dragons, flowing water or a mythical creature that is part-lion, part-elephant. Men carve in wood or bone. Some carvings have religious significance; others portray scenes from everyday life. As elsewhere in the region, Lao crafts emerged primarily as an expression of the ritual or functional needs of rural society, although state intervention began at an early date with the commissioning of high-quality craft items for the Lao royal courts and temples. In marked contrast to the situation in neighbouring Việt Nam and Cambodia, the French colonial government made little effort to exploit the Lao craft sector for economic purposes. Prince Phetsarath's School of Arts, which operated between 1932 and 1936 at Vientiane's Wat Chanthaburi (Wat Chan), was intended primarily to raise the standards of craftsmanship amongst the Buddhist sangha. Meanwhile French expatriate artist Marc Leguay, who opened a private art school in the Khong District of Champassak Province in 1940, would appear to have been motivated by the desire to nurture indigenous creative talent and at the same time provide an additional source of livelihood to individuals in that region. Following the establishment of the National School of Fine Arts (now the National Faculty of Fine Arts) in 1959, the Royal Lao Government introduced a number of initiatives to develop the craft sector for both domestic and foreign markets. However, by 1975 craft products were still not contributing significantly to the country's foreign trade. Between 1975 and 1985 Laos was effectively closed to world markets and craft items were once more produced mostly for domestic or community usage. However, with the advent of the New Economic Mechanism (NEM) after 1986, an increasing number of both state and private craft enterprises were set up and there began a steady shift back to market production. Since the establishment of the Department of Handicrafts of the Ministry of Industry and Handicrafts in 1999 and the Lao Handicraft Group (now the Lao Handicraft Association) in 2001 there has been a more sustained effort to target foreign markets, with annual trade fairs to promote Lao crafts both at home and abroad. At the time of writing there are just over 26,000 registered small handicraft businesses in Laos. Lao craft production currently accounts for just fewer than 15 per cent of total industrial output, and the government is seeking to increase this. The importance of the handicrafts sector to the Lao economy is illustrated by the fact that when an industry and handicraft exhibition is held around 80-90 per cent of the products on display are handicrafts. Textiles currently make up the largest single area of all Lao craft production. The production of woven and embroidered textiles is undoubtedly the most prolific of all traditional crafts in Laos. Produced in many different styles and dyed in a range of different colours according to the geographical provenance and ethnicity of the weavers, silk and cotton cloth is hand-woven on traditional wooden frame looms by the ethnic Lao and most other Tai-speaking ethnicities to create the ubiquitous wrap-around skirts with elaborately bordered hems (pha sin), ceremonial shawls (pha biang), shoulder bags and many other articles of Lao traditional clothing. All regions of the country are suitable for the farming of cotton and mulberry trees, which are often planted on co-operative land with a view to providing raw materials for the wider community. Traditional weaving techniques handed down from one generation to the next include chok (discontinuous supplementary weft technique), khit (continuous supplementary weft technique), mat mi (resist-dyeing technique), ghot (tapestry weave technique), muk (continuous supplementary warp technique) and muko (a combination of the muk, mat mi and chok techniques). Various regional styles may be identified, ranging from the solid colour and striped pattern mix of northern chok and supplementary thread silk textiles to the Khmer-style PHA chongkraben of the southern provinces. Motifs used also vary from region to region, but the use of gold and silver threads and protective diamond- and star-shaped designs and images of mythical animals such as dragons and nagas are common to many parts of the country. In recent years the migration of many provincial weaving families to Vientiane to seek employment there has led to the evolution of a new, modern style of Lao textile which includes both regional and international designs. Sadly textile weaving and dyeing has largely died out amongst the Mon-Khmer ethnicities of Laos, but Hmong, Yao and Sino-Tibetan ethnicities such as the Lolo-Burmish speaking Akha, Ha Nhi, Lolo and Phunoi continue to weave and dye their own clothes. However, the latter are perhaps best known for their sewing and embroidering skills, which have given rise to some of the most spectacular and colourful traditional costumes in the world. In recent years the Ministry of Industry and Handicrafts, assisted by the Lao National Chamber of Commerce and Industry (LNCCI) and the Lao Handicraft Association, has made strenuous efforts to revitalise traditional weaving as a sustainable enterprise through the development of incentive and protection schemes, training, promotion and marketing. The Lao Women's Union's Lao Cotton State Enterprise (LCSE) and non-governmental initiatives such as Lao Textiles by Carol Cassidy have also made a significant contribution to the revival of this important craft sector. Pottery dating back to the 3rd and 2nd centuries CE has been unearthed at Ban Pako near Vientiane, indicating that ceramic production has a long history in Laos. In 1970 fragments of both glazed and unglazed ware dating from the 15th to the 17th centuries were excavated from the Sisatthanak Kiln Site in Vientiane's Sisatthanak District, suggesting that during the Lane Xang era Lao kilns were producing high-quality celadon. Excavations in the vicinity of Ban Xang Hai on the outskirts of Luang Prabang in 1991 also revealed the remains of kilns and fragments of brown glazed jars. Modern ceramic production in Laos is undertaken mainly on an industrial basis by companies working in major centres of population such as Vientiane or Savannakhet. However, a few traditional ceramics villages have survived and continue to produce utilitarian pottery items aimed at both the domestic and foreign markets. Perhaps the best-known of these is Ban Chan in Luang Prabang. Archaeological evidence indicates that gold and silver smithing was practised from an early date in those areas of modern Laos which once formed part of the Khmer empire (9th-13th centuries). However, significant development of this craft did not take place until the first half of the 16th century, when a class of skilled gold and silversmiths emerged at the royal court of Xiang Dong Xiang Thong (Luang Prabang), most probably under the influence of Lanna, an important early centre of gold and silverware production. Thereafter mining increased to provide the raw materials for the production of elaborately-decorated ceremonial boxes, urns and items of jewellery for members of the royal family and aristocracy and votive items for Buddhist temples. From the early years of the 20th century necklaces, bracelets, earrings and a range of distinctive small containers for the storage of betel and home made cosmetic preparations began to be produced to meet the demands of the growing urban population. Before 1975 Luang Prabang was known as a major centre for high-quality silverware. However, both gold and silversmithing declined after 1975 and has only recently begun to recover. In recent years both the Lao Handicraft Association and the Design Centre Vientiane have offered short training courses in gold and silversmithing with a view to helping Lao craftsperson’s to develop new products and to upgrade the quality of existing goods. 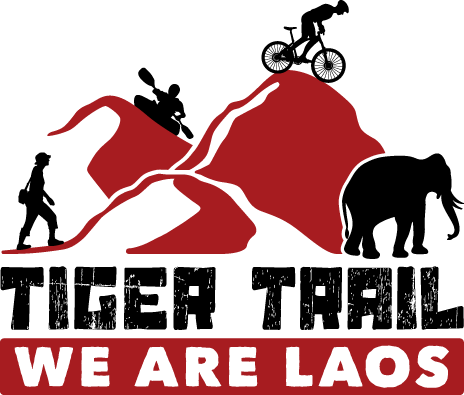 At the time of writing too the Lao Handicraft Association is co-operating with private businesses to draw up professional standards for gold and silversmiths in Laos and to develop a two-year gold and silversmithing course to be offered at vocational training schools throughout the country. At one time forests covered much of Laos, providing the raw materials for the emergence of woodcarving as a major craft. Woodcarving traditionally served as a sculptural art, and with the spread of Buddhism it assumed an increasingly important role in the production of Buddha images and the carving of temple and palace door frames, pillars, roofs, lintels and decorative friezes. During the Lane Xang era skilled carpenters were also employed to produce royal thrones, ornate wooden furniture, royal barges and other forms of regal and aristocratic transportation such as palanquins and elephant howdahs. By the early 20th century their work had expanded to include the production of high-quality tables, chairs and cabinets for a growing urban middle class. The decline in traditional Buddhist practices during the 1970s resulted in the loss of many traditional woodcarving skills within the monkhood which the UNESCO Cultural Survival and Revival in the Buddhist Sangha Project in Luang Prabang, is currently seeking to revive. In the meantime, despite restrictions on woodcutting designed to halt the country’s already serious environmental degradation, demand for domestic furniture shows no sign of abating. Paper has been made by hand in the wider region for over 700 years using the bark of the local sa or mulberry tree (broussonetia papyrifera vent). The bark is crushed and soaked in water until it had dissolved into a paste. The liquid is then scooped out, poured through a bamboo sieve and finally placed in a thin layer on a bamboo bed and dried in the sun. Traditionally SA paper was used for calligraphy and for making festive temple decorations, umbrellas, fans and kites. In former times it was also used as a filter in the manufacture of lacquer ware. In recent years the art of SA paper handicraft has been revived, particularly in Luang Prabang where it is now used to create lampshades, writing paper, greetings cards and bookmarks. In an environmentally-focused initiative funded by the Japan International Co-operation Agency (JICA), Laos through its Forest Conservation and Forestation Project (FORCAP), Japanese paper weaving techniques have been taught to villagers in Vangvieng District of Vientiane Province, enabling them to produce an innovative new handicraft which meshes the traditional Lao crafts of weaving and papermaking. SA paper is used for weft and cotton or silk for warp; yarns are dyed with natural materials that are available locally, and woven into local patterns. In 2002 Vangvieng Posa Handicraft was commended under the UNESCO-AHPADA Award of Excellence for Handicrafts Programme scheme. Though often reflecting craftsmanship of the highest aesthetic quality, traditional Buddhist painting and sculpture was neither conceived nor perceived as art - its sole purpose was to educate and enlighten. Numerous other crafts have developed over the centuries, their production aimed initially at domestic use but later being developed to meet the needs of international markets. The manufacture of household objects from bamboo, rattan and various other types of reed has been practised for centuries, by both the majority Lao community and other ethnic groups. Light, durable and termite-resistant, these objects take many forms, ranging from baskets and containers to furniture, and are now an important industry in their own right. There is evidence to suggest that lacquer ware was once found widely in Laos, although it has since died out completely. With assistance from Myanmar, efforts are currently being made to reintroduce the art to the northern city of Luang Prabang by placing it on the syllabus of the Luang Prabang Provincial Secondary School of Fine Arts. However, early pieces produced at the school are heavily reminiscent of contemporary Burmese lacquer ware and it remains to be seen whether this initiative will succeed in establishing a truly indigenous style.